HCVKC5 steam conditioning valve combines pressure and temperature control in a single valve. Temperature reduction is up to water (e.g., feedwater) injection under high pressure conditions. HCVKC5 type is commonly used as turbine start or discharge valve. HCVKC5 is an angle valve. Coolant, i.e. water, is injected under the plug. Forged body of the valve has equal walls’ thickness (gauge), what reduces the thermal stresses during valve’s warming up and cooling. 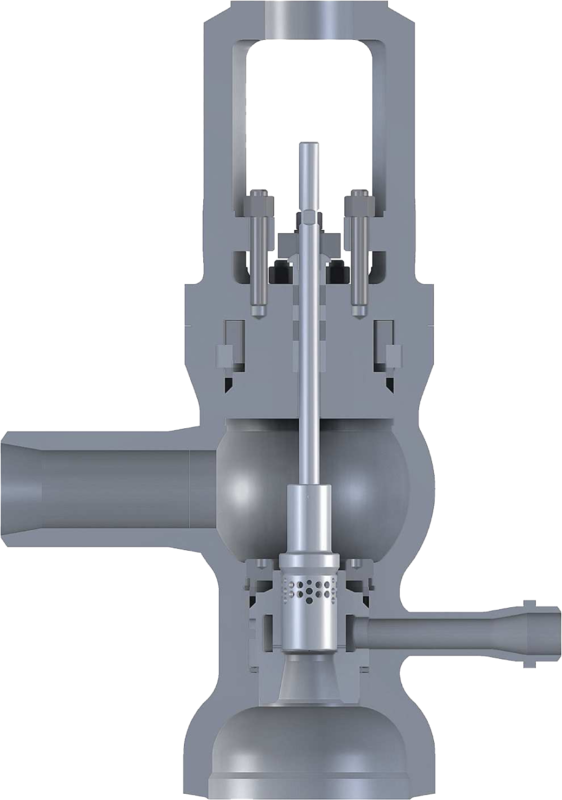 Basically, the valve consists of: body, self-sealing inner bonnet integrated with cage, main plug (perforated, pressure balanced by inner plug–so called pilot plug), and slip-in seat (pressed by screw plug). The cage drives the main plug. The mentioned seat has nozzles responsible to deliver adequately sprayed water, supplied to the body through one or two connection pipes. A medium undergoes single-stage expansion. In case of perforated plug, only its perforation is responsible for pressure reduction; the cage does not. The main plug also opens water nozzles one after another; the pilot plug does not. HCVKC5 valve works with media flow directed over the plug. Its construction allows to increase the number of expansion’s steps (additional appliances are assembled on the outlet pipe). Any control of coolant’s flow demands an implementation of additional injection valve. HCVKC5 valve also has the special version: with unbalanced plug.